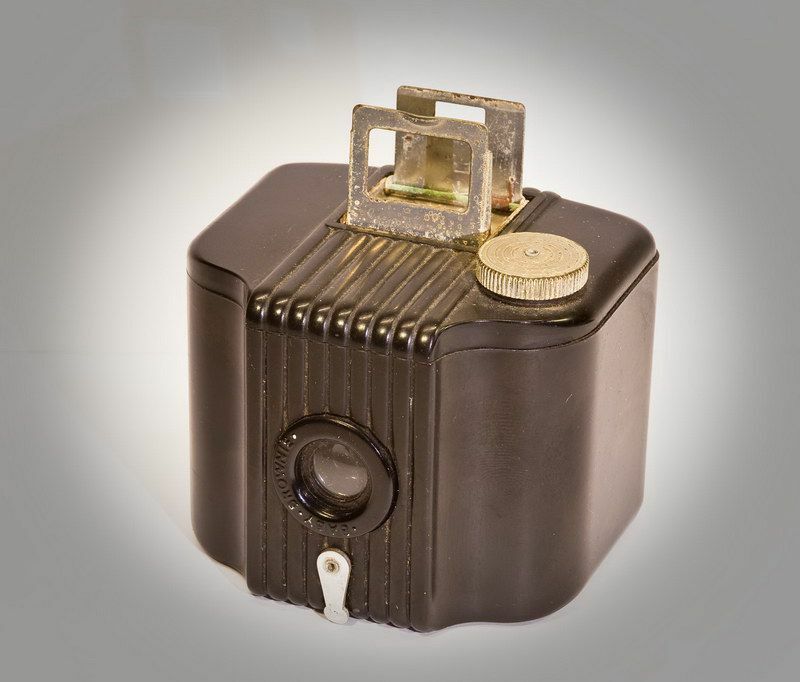 An early compact camera by Kodak. The view finder was a crude pop up pair of metal frames which was just a guide to what you were shooting. The camera, that in the early 70’s when I was in the later years of primary school at Hampton Park, introduced me to photography, the Baby Brownie from Kodak. I don’t know who owned it originally but it was a fun thing to get. I could now take photos! Made by Kodak from 1934 the Baby Brownie took 127 film and was made of Bakelite. The shutter is operated by moving the lever below the fixed focus lens and consisted of two plates that as they moved past each other two holes lined up allowing the light to expost the film. Agfa Isolette. Note the controls on the front of the lens. A button on top would release the lens and the bellows would pop out. Agfa Isolette I with the Agfa Agnar lens (f/4.5 85mm), 1952-1958. With the shutter and aperture settings on the front of the lens this was an awkward camera to use. Initially I would set them using a light meter, but after a while I got used to guessing the settings, most of the time they were correct. Of course you didn’t know you had messed up until the film got processed. Double exposures happened if you forgot to wind the film on. This camera was a prize from a competition where you had to answer a question creatively in so many words. At the time I was using my Agfa Isolette I. It was won when I was in Grade 6 at Beaconsfield Upper Primary School during 1974. It took 126 sized film (an easy to load version of 35mm film) and it came with a fixed focus lens. It used “magic cube” flash cubes. It was easy to use and handy for quick photos at parties but the photos weren’t very clear. From a photography point of view it was a step backwards from the Agfa Isolette. Bought when I was in Year 11 (aka Form 5 in 1979) this was my introduction to 35mm SLR photography. This was a great reliable camera which saw many years and miles of service. Whilst in Fiji I bought a zooms lens for it and the disadvantage of the screw mount lens became obvious. It was very easy to cross thread the mount if you weren’t careful. At this time I began processing my own films using a Paterson film tank and an LPL Enlarger. I never got into colour as the process is expensive and you need to have precise control over the temperatures of your chemicals. 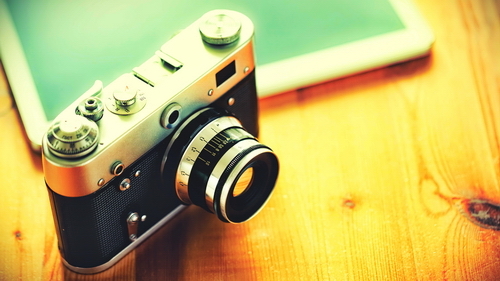 The Olympus Trip 35 is and excellent camera belonged to Karen’s father. It took clear photos using several ranges on the lens, the light meter used a solar cell and it did not need a battery. The only problem we had with was the latch for the film compartment sometimes opened. After experiencing this it was apparent we needed a new camera. We used it up until about December 1993 when a new camera was bought. This rather long named camera was bought in December 1993 to allow photos to be taken quickly without the fuss of the SLR. This camera was easy to use all round. Easy to load (it set the ASA itself), self-winding, auto focus, auto exposure and power zoom. And when the film was finished it rewound the film back into the canister. The photos were almost as sharp as the Practica. The panorama feature wasn’t much use as it just cropped the top and bottom of the photo. If you bothered using the “panorama” stickers to label your film the processing lab would charge you extra to enlarge the panorama shots. One great feature was the addition of the date on the photos. The date could be printed on each image if desired; this has made cataloging the photos belatedly a much easier task. Overall the Ricoh Shotmaster Ultra Zoom Super Date was a great camera. The focus wasn’t quite as sharp as the SLR but it was quick and easy to use. My first digital camera bought around May 2002. It’s first trip was the Mathoura and Echuca break. It went well until I ran out of card space. Digital SLR photography at its best!